If you’ve ever wanted a boat, there just might be a bargain waiting for you if you’re willing to try to win an auction. Of course, this isn’t just any old boat, this is an aircraft carrier. In fact, this is one of the most famous aircraft carriers in the world. The former flagship of the Royal Navy, the HMS Ark Royal aircraft carrier, is up for sale to the highest bidder. The Ministry of Defense is auctioning off the venerable battleship two weeks after decommissioning it after a government budget review. 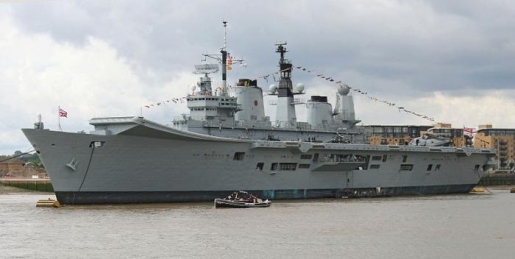 While you can’t try before you buy, parties interested in buying the HMS Ark Royal can check the ship out at her home, Portsmouth Naval Base, on May 3 and 4. I imagine you can give her a look-over at that point, ask about what accessories comes with the purchase of a ship, and any customer service programs that may be available. Interested buyers must submit an outline of their “intentions regarding the vessel” prior to bidding at the auction. All in all, she’s not a bad ship for 25 years old; ships tend to age better than cars, so that’s to be expected. If you can’t afford an aircraft carrier, there’s also three destroyers up for sale: the HMS Exeter, HMS Southampton, and HMS Nottingham. Good luck to all bidding parties!